It is a rare occurrence when two African fighters meet in a world title bout. It is also rare that a fight on the undercard of an Arturo Gatti show gets much attention. But this one is worthy of a look and not just because of the historical significance. IBF junior middleweight champion Kassim Ouma, of Uganda, puts his title on the line against Kofi Jantuah, of Ghana, Jan. 29 in Atlantic City. It is the first all African world title fight since 1957, when Kid Bassey (Nigeria) knocked out Cherrif Hamia (Algeria) to win the vacant featherweight title. Ouma rarely takes a backward step in the ring and Jantuah has knocked out his last seven opponents. Ever since his blistering first round knockout of unbeaten prospect Marco Antonio Rubio in September, Jantuah has positioned himself as the division's top contender. A month later, Ouma captured the IBF belt with a decision over veteran Verno Phillips and the matchup seemed inevitable. With Gatti talking about using his boxing skills – a la Gatti-Micky Ward II – this contest could upstage the main event. On Wednesday, Ouma and Jantuah spoke with the national boxing media during a conference call. “I've been training hard,” said Jantuah, 28-1 with 18 knockouts. “My conditioning is very good. I'm ready to go. My game plan is to take the fight to him and make him fight,” said Jantuah. No one ever accused the aggressive Ouma of being a typical southpaw. “Whatever he brings to me, I'll answer him back and you'll find out from there,” said Ouma. Ouma, 20-1-1, 13 knockouts, said he doesn't regard Jantuah as a big puncher and argued that a puncher has to land his punches to score a knockout. “He's not going to catch me with his punches,” Ouma said. The story of Ouma has been well documented. At the age of 7 he was kidnapped from elementary school by the National Resistance Army and forced to fight in Uganda's bloody Civil War. He survived for 10 years as a soldier and finally made his way to America in 1998. It's a time in his life that Ouma prefers not to think about, and since his career took off he doesn't dwell on the past. Although he was forced into action with the NRA, his service with the rebel group has led the Ugandan government to consider him an outlaw. Jantuah said that although Ghana was not at Civil War, he did not have an easy childhood. 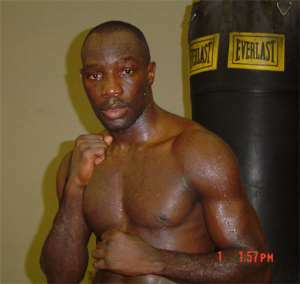 He said he ran the streets and eventually learned how to box from Hall-of-Famer Azumah Nelson. Jantuah wants to uphold the tradition of Ghanaian champions like Nelson and Ike Quartey. Ouma wants to start his own tradition here in the States and his first move is to upstage Gatti on Janury 29.